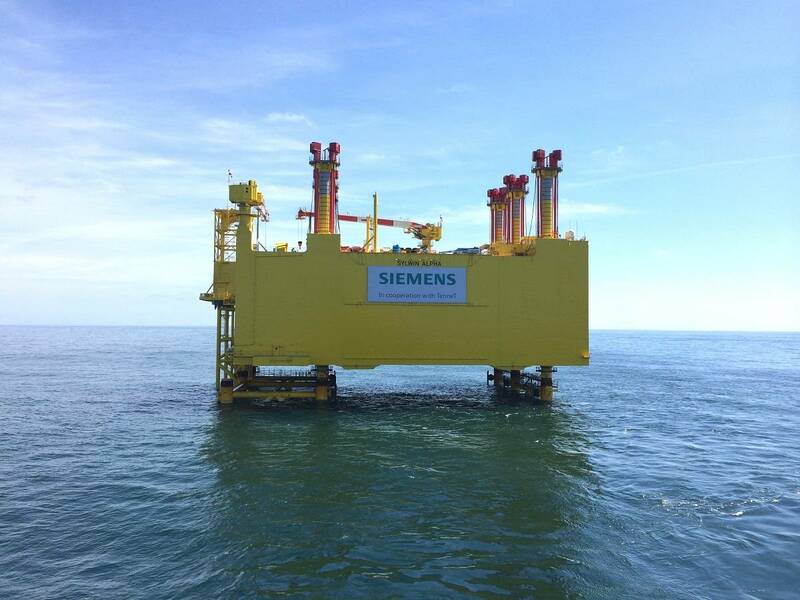 A combination of three Dutch offshore companies realized a unique operation in the North Sea, installing a giant ‘power socket’, the SylWin alpha platform. 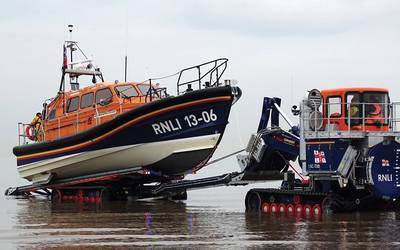 Siemens commissioned Seaway Heavy Lifting to perform an unusual operation that in turn called in the assistance of maritime service provider Dockwise and engineered heavy lifting and transport specialist Mammoet. Weighing 14,000 metric tons, the 83-meter long, 56-meter wide and 26-meter high SylWin alpha platform, built by Siemens, is the largest in its kind. As it exceeds the lifting capacity of floating cranes, the 'float-over method' was applied to move it from a pontoon onto the already installed ‘jacket’ (the base of the platform). Previously, this approach had been used successfully in the Gulf of Mexico and in the Far East, but this was the first time the method was applied in the North Sea. The platform was transported to the jacket on the pontoon, and subsequently positioned between the jacket legs. It was installed onto the legs of the jacket by ballasting the pontoon. Dockwise was responsible for this phase. Mammoet then used strand jacks to lift the platform up to its final position on the jacket. Customized for this project, Mammoet devised a time-saving method that allowed fast installation and removal of the strand jacks, which the company said saved nine days at one of the most crucial stages in the project. The lifting equipment Mammoet utilized to elevate the platform is called the ’strand jack system’, a hydraulic lifting system with multiple strand wires to lift a load. At the yard, prior to the operation at sea, 44 strand jacks with a capacity of 900 tons each, were installed on top of the 6 platform legs. The strand jacks were secured in a revolutionary new way that allowed much faster removal. The platform was elevated 15 meters in one day, after which the strand jacks were removed in only one week, making the platform ready for commissioning. The SylWin alpha converter platform will serve as a ‘power socket’ for the DanTysk, Sandbank and Butendiek wind farms, which together comprise 240 wind turbines and represent a generating capacity of 864 megawatt. Grid manager TenneT, Siemens' customer, is responsible for the connection of the wind farms to, in this case, the German high voltage grid. The SylWin alpha platform transforms the alternating current generated by the wind turbines into direct current that is transported via a 160-km long seabed cable and a 45-km long underground cable to the onshore Büttel high-voltage station. As a contribution to sustainable energy provision, Northern Europe already has 40 offshore wind farms in operation, another 40 will be installed in the coming 10 years. TenneT, the grid manager, is installing the offshore electricity grid in the German and Dutch sectors of the North Sea to which the wind farms will be connected. Dutch offshore companies are playing an important role in installing the wind farms and the electricity grid.